Phytophthora infestans is an oomycete or water mold, a microorganism that causes the serious potato and tomato disease known as late blight or potato blight. (Early blight, caused by Alternaria solani, is also often called "potato blight".) Late blight was a major culprit in the 1840s European, the 1845 Irish, and the 1846 Highland potato famines. The organism can also infect some other members of the Solanaceae. The pathogen is favored by moist, cool environments: sporulation is optimal at 12–18 °C in water-saturated or nearly saturated environments, and zoospore production is favored at temperatures below 15 °C. Lesion growth rates are typically optimal at a slightly warmer temperature range of 20 to 24 °C. The genus name Phytophthora comes from the Greek φυτό-(phyto), meaning : "plant" - plus the Greek φθορά (phthora), meaning : "decay, ruin, perish". The species name infestans is the present participle of the Latin verb infestare, meaning : "attacking, destroying", from which we get the word "to infest". Ripe tomato infected with blight. Tomato plant infected with blight. Unripe tomatoes infected with blight. 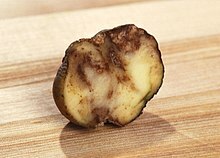 Potatoes infected with late blight are shrunken on the outside, corky and rotted inside. The asexual life cycle of Phytophthora infestans is characterized by alternating phases of hyphal growth, sporulation, sporangia germination (either through zoospore release or direct germination, i.e. germ tube emergence from the sporangium), and the re-establishment of hyphal growth. There is also a sexual cycle, which occurs when isolates of opposite mating type (A1 and A2) meet. 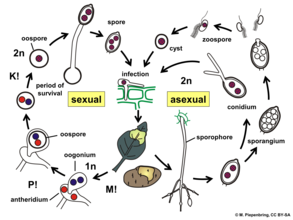 Hormonal communication triggers the formation of the sexual spores, called oospores. The different types of spores play major roles in the dissemination and survival of P. infestans. Sporangia are spread by wind or water and enable the movement of P. infestans between different host plants. The zoospores released from sporangia are biflagellated and chemotactic, allowing further movement of P. infestans on water films found on leaves or soils. Both sporangia and zoospores are short-lived, in contrast to oospores which can persist in a viable form for many years. The color of potato sign is white. People can observe Phytophthora infestans produce sporangia and sporangiophores on the surface of potato stems and leaves. These sporangia and sporangiophores always appear on the lower surface of the foliage. As for tuber blight, the white mycelium often shows on the tubers' surface. Under ideal conditions, the life cycle can be completed on potato or tomato foliage in about five days. Sporangia develop on the leaves, spreading through the crop when temperatures are above 10 °C (50 °F) and humidity is over 75–80% for 2 days or more. Rain can wash spores into the soil where they infect young tubers, and the spores can also travel long distances on the wind. The early stages of blight are easily missed. Symptoms include the appearance of dark blotches on leaf tips and plant stems. White mold will appear under the leaves in humid conditions and the whole plant may quickly collapse. Infected tubers develop grey or dark patches that are reddish brown beneath the skin, and quickly decay to a foul-smelling mush caused by the infestation of secondary soft bacterial rots. Seemingly healthy tubers may rot later when in store. P. infestans survives poorly in nature apart from its plant hosts. 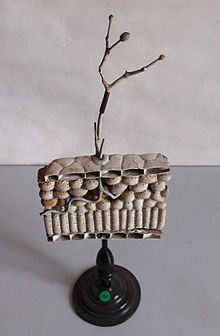 Under most conditions, the hyphae and asexual sporangia can survive for only brief periods in plant debris or soil, and are generally killed off during frosts or very warm weather. The exceptions involve oospores, and hyphae present within tubers. The persistence of viable pathogen within tubers, such as those that are left in the ground after the previous year's harvest or left in cull piles is a major problem in disease management. In particular, volunteer plants sprouting from infected tubers are thought to be a major source of inoculum at the start of a growing season. This can have devastating effects by destroying entire crops. P. infestans is diploid, with about 11-13 chromosomes, and in 2009 scientists completed the sequencing of its genome. The genome was found to be considerably larger (240 Mbp) than that of most other Phytophthora species whose genomes have been sequenced; Phytophthora sojae has a 95 Mbp genome and Phytophthora ramorum had a 65 Mbp genome. About 18,000 genes were detected within the P. infestans genome. It also contained a diverse variety of transposons and many gene families encoding for effector proteins that are involved in causing pathogenicity. These proteins are split into two main groups depending on whether they are produced by the water mould in the symplast (inside plant cells) or in the apoplast (between plant cells). Proteins produced in the symplast included RXLR proteins, which contain an arginine-X-leucine-arginine (where X can be any amino acid) sequence at the amino terminus of the protein. Some RXLR proteins are avirulence proteins, meaning that they can be detected by the plant and lead to a hypersensitive response which restricts the growth of the pathogen. P. infestans was found to encode around 60% more of these proteins than most other Phytophthora species. Those found in the apoplast include hydrolytic enzymes such as proteases, lipases and glycosylases that act to degrade plant tissue, enzyme inhibitors to protect against host defence enzymes and necrotizing toxins. Overall the genome was found to have an extremely high repeat content (around 74%) and to have an unusual gene distribution in that some areas contain many genes whereas others contain very few. The highlands of central Mexico are considered by many to be the center of origin of P. infestans, although others have proposed its origin to be in the Andes, which is also the origin of potatoes. A recent study evaluated these two alternate hypotheses and found conclusive support for central Mexico being the center of origin. Support for Mexico comes from multiple observations including the fact that populations are genetically most diverse in Mexico, late blight is observed in native tuber-bearing Solanum species, populations of the pathogen are in Hardy-Weinberg equilibrium, the two mating types occur in a 1:1 ratio, and detailed phylogeographic and evolutionary studies. Furthermore, the closest relatives of P. infestans, namely P. mirabilis and P. ipomoeae are endemic to central Mexico. On the other hand, the only close relative found in South America, namely P. andina, is a hybrid that does not share a single common ancestor with P. infestans. Finally, populations of P. infestans in South America lack genetic diversity and are clonal. Migrations from Mexico to North America or Europe have occurred several times throughout history, probably linked to the movement of tubers. Until the 1970s, the A2 mating type was restricted to Mexico, but now in many regions of the world both A1 and A2 isolates can be found in the same region. The co-occurrence of the two mating types is significant due to the possibility of sexual recombination and formation of oospores, which can survive the winter. Only in Mexico and Scandinavia, however, is oospore formation thought to play a role in overwintering. In other parts of Europe, increasing genetic diversity has been observed as a consequence of sexual reproduction This is notable since different forms of P. infestans vary in their aggressiveness on potato or tomato, in sporulation rate, and sensitivity to fungicides. Variation in such traits also occurs in North America, however importation of new genotypes from Mexico appears to be the predominant cause of genetic diversity, as opposed to sexual recombination within potato or tomato fields. Many of the strains that appeared outside of Mexico since the 1980s have been more aggressive, leading to increased crop losses. Some of the differences between strains may be related to variation in the RXLR effectors that are present. P. infestans is still a difficult disease to control. There are many chemical options in agriculture for the control of both damage to the foliage and infections of the tuber. A few of the most common foliar-applied fungicides are Ridomil, a Gavel/SuperTin tank mix, and Previcur Flex. All of the aforementioned fungicides need to be tank mixed with a broad-spectrum fungicide such as mancozeb or chlorothalonil not just for resistance management but also because the potato plants will be attacked by other pathogens at the same time. If adequate field scouting occurs and late blight is found soon after disease development, localized patches of potato plants can be killed with a desiccant (e.g. paraquat) through the use of a backpack sprayer. This management technique can be thought of as a field-scale hypersensitive response similar to what occurs in some plant-viral interactions whereby cells surrounding the initial point of infection are killed in order to prevent proliferation of the pathogen. If infected tubers make it into the storage bin, there's a very high risk to the storage life of that bin. Once in storage, there isn't much that can be done besides emptying the parts of the bin that contain tubers infected with Phytophthora infestans. To increase the probability of successfully storing potatoes from a field where late blight was known to occur during the growing season, some products can be applied just prior to entering storage (e.g. Phostrol). The problem with products being sprayed on tubers just prior to storage is that you are applying these products in an aqueous solution and high moisture carries a high risk of tuber breakdown due to wide range of pathogens. Around the world the disease causes around $6 billion of damage to crops each year. Potatoes after exposure to Phytophthora infestans. The normal potatoes have blight but the cisgenic potatoes are healthy. Breeding for resistance, particularly in potato, has had limited success in part due to difficulties in crossing cultivated potato to its wild relatives, which are the source of potential resistance genes. In addition, most resistance genes only work against a subset of P. infestans isolates, since effective plant disease resistance only results when the pathogen expresses a RXLR effector gene that matches the corresponding plant resistance (R) gene; effector-R gene interactions trigger a range of plant defenses, such as the production of compounds toxic to the pathogen. Potato and tomato varieties vary in their susceptibility to blight. Most early varieties are very vulnerable; they should be planted early so that the crop matures before blight starts (usually in July in the Northern Hemisphere). Many old crop varieties, such as King Edward potato are also very susceptible but are grown because they are wanted commercially. Maincrop varieties which are very slow to develop blight include Cara, Stirling, Teena, Torridon, Remarka, and Romano. Some so-called resistant varieties can resist some strains of blight and not others, so their performance may vary depending on which are around. These crops have had polygenic resistance bred into them, and are known as "field resistant". New varieties such as Sarpo Mira and Sarpo Axona show great resistance to blight even in areas of heavy infestation. Defender is an American cultivar whose parentage includes Ranger Russet and Polish potatoes resistant to late blight. It is a long white-skinned cultivar with both foliar and tuber resistance to late blight. Defender was released in 2004. Genetic engineering may also provide options for generating resistance cultivars. A resistance gene effective against most known strains of blight has been identified from a wild relative of the potato, Solanum bulbocastanum, and introduced by genetic engineering into cultivated varieties of potato. This is an example of cisgenic genetic engineering. Blight can be controlled by limiting the source of inoculum. Only good-quality seed potatoes and tomatoes obtained from certified suppliers should be planted. Often discarded potatoes from the previous season and self-sown tubers can act as sources of inoculum. Compost, soil or potting medium can be heat-treated to kill oomycetes such as Phytophthora infestans. The recommended sterilisation temperature for oomycetes is 120 °F (49 °C) for 30 minutes. There are several environmental conditions that are conducive to P. infestans. An example of such took place in the United States during the 2009 growing season. As colder than average for the season and with greater than average rainfall, there was a major infestation of tomato plants, specifically in the eastern states. By using weather forecasting systems, such as BLITECAST, if the following conditions occur as the canopy of the crop closes, then the use of fungicides is recommended to prevent an epidemic. A Beaumont Period is a period of 48 consecutive hours, in at least 46 of which the hourly readings of temperature and relative humidity at a given place have not been less than 10 °C (50 °F) and 75%, respectively. A Smith Period is at least two consecutive days where min temperature is 10 °C (50 °F) or above and on each day at least 11 hours when the relative humidity is greater than 90%. The Beaumont and Smith periods have traditionally been used by growers in the United Kingdom, with different criteria developed by growers in other regions. The Smith period has been the preferred system used in the UK since its introduction in the 1970s. Based on these conditions and other factors, several tools have been developed to help growers manage the disease and plan fungicide applications. Often these are deployed as part of Decision support systems accessible through web sites or smart phones. Several studies have attempted to develop systems for real-time detection via flow cytometry or microscopy of airborne sporangia collected in air samplers. Whilst these methods show potential to allow detection of sporangia in advance of occurrence of detectable disease symptoms on plants, and would thus be useful in enhancing existing Decision support systems, none have been commercially deployed to date. Spraying in a potato field for prevention of potato blight in Nottinghamshire, England. Fungicides for the control of potato blight are normally only used in a preventative manner, optionally in conjunction with disease forecasting. In susceptible varieties, sometimes fungicide applications may be needed weekly. An early spray is most effective. The choice of fungicide can depend on the nature of local strains of P. infestans. Metalaxyl is a fungicide that was marketed for use against P. infestans, but suffered serious resistance issues when used on its own. In some regions of the world during the 1980s and 1990s, most strains of P. infestans became resistant to metalaxyl, but in subsequent years many populations shifted back to sensitivity. To reduce the occurrence of resistance, it is strongly advised to use single-target fungicides such as metalaxyl along with carbamate compounds. A combination of other compounds are recommended for managing metalaxyl-resistant strains. These include mandipropamid, chlorothalonil, fluazinam, triphenyltin, mancozeb, and others. In the United States, the Environmental Protection Agency has approved oxathiapiprolin for use against late blight. In the past, copper(II) sulfate solution (called 'bluestone') was used to combat potato blight. Copper pesticides remain in use on organic crops, both in the form of copper hydroxide and copper sulfate. Given the dangers of copper toxicity, other organic control options that have been shown to be effective include horticultural oils, phosphorous acids, and rhamnolipid biosurfactants, while sprays containing "beneficial" microbes such as Bacillus subtilis or compounds that encourage the plant to produce defensive chemicals (such as knotweed extract) have not performed as well. Ridging is often used to reduce tuber contamination by blight. This normally involves piling soil or mulch around the stems of the potato blight meaning the pathogen has farther to travel to get to the tuber. Another approach is to destroy the canopy around five weeks before harvest, using a contact herbicide or sulfuric acid to burn off the foliage. Eliminating infected foliage reduces the likelihood of tuber infection. The effects of Phytophthora infestans in Ireland in 1845–52 were one of the factors which caused over one million to starve to death and forced another two million to emigrate from affected countries. Most commonly referenced is the Great Irish Famine, during the late 1840s. The first recorded instances of the disease were in the United States, in Philadelphia and New York City in early 1843. Winds then spread the spores, and in 1845 it was found from Illinois to Nova Scotia, and from Virginia to Ontario. It crossed the Atlantic Ocean with a shipment of seed potatoes for Belgian farmers in 1845. All of the potato-growing countries in Europe were affected, but the potato blight hit Ireland the hardest. Implicated in Ireland's fate was the island's disproportionate dependency on a single variety of potato, the Irish Lumper. The lack of genetic variability created a susceptible host population for the organism. During the First World War, all of the copper in Germany was used for shell casings and electric wire and therefore none was available for making copper sulfate to spray potatoes. A major late blight outbreak on potato in Germany therefore went untreated, and the resulting scarcity of potatoes led to the deaths of 700,000 German civilians from starvation. France, Canada, the United States, and the Soviet Union researched P. infestans as a biological weapon in the 1940s and 1950s. Potato blight was one of more than 17 agents that the United States researched as potential biological weapons before the nation suspended its biological weapons program. Whether a weapon based on the pathogen would be effective is questionable, due to the difficulties in delivering viable pathogen to an enemy's fields, and the role of uncontrollable environmental factors in spreading the disease. ^ Judelson HS, Blanco FA (2005) The spores of Phytophthora: weapons of the plant destroyer. Nature Microbiology Reviews 3: 47–58. ^ Gomez-Alpizar, L; Carbone, I; Ristaino, JB (2007). "An Andean origin of Phytophthora infestans inferred from mitochondrial and nuclear gene genealogies". Proc Natl Acad Sci USA. 104 (9): 3306–11. Bibcode:2007PNAS..104.3306G. doi:10.1073/pnas.0611479104. PMC 1805513. PMID 17360643. ^ a b c Grünwald, N. J.; Flier, W. G. (2005). "The Biology of Phytophthora infestans at Its Center of Origin". Annual Review of Phytopathology. 43: 171–90. doi:10.1146/annurev.phyto.43.040204.135906. PMID 16078881. ^ a b c Goss, E. M.; Tabima, J. F.; Cooke, D. E. L.; Restrepo, S.; Fry, W. E.; Forbes, G. A.; Fieland, V. J.; Cardenas, M.; Grünwald, N. J. (2014). "The Irish potato famine pathogen Phytophthora infestans originated in central Mexico rather than the Andes". Proceedings of the National Academy of Sciences. 111 (24): 8791–96. Bibcode:2014PNAS..111.8791G. doi:10.1073/pnas.1401884111. PMC 4066499. PMID 24889615. ^ Grünwald, N. J.; Flier, W. G.; Sturbaum, A. K.; Garay-Serrano, E.; Van Den Bosch, T. B. M.; Smart, C. D.; Matuszak, J. M.; Lozoya-Saldaña, H.; Turkensteen, L. J.; Fry, W. E. (2001). "Population Structure of Phytophthora infestans in the Toluca Valley Region of Central Mexico". Phytopathology. 91 (9): 882–90. doi:10.1094/PHYTO.2001.91.9.882. PMID 18944234. ^ Flier, W. G.; Grünwald, N. J.; Kroon, L. P. N. M.; Sturbaum, A. K.; Van Den Bosch, T. B. M.; Garay-Serrano, E.; Lozoya-Saldaña, H.; Fry, W. E.; Turkensteen, L. J. (2003). "The population structure of Phytophthora infestans from the Toluca valley of central Mexico suggests genetic differentiation between populations from cultivated Potato and wild Solanum spp". Phytopathology. 93 (4): 382–90. doi:10.1094/PHYTO.2003.93.4.382. PMID 18944351. ^ Flier, W. G.; Grünwald, N. J.; Fry, W. E.; Turkensteen, L. J. (2001). "Formation, production and viability of oospores of Phytophthora infestans from potato and Solanum demissum in the Toluca Valley, central Mexico". Mycological Research. 105 (8): 998–1006. doi:10.1016/S0953-7562(08)61958-9. ^ Forbes, G. A.; Escobar, X. C.; Ayala, C. C.; Revelo, J.; Ordoñez, M. E.; Fry, B. A.; Doucett, K.; Fry, W. E. (1997). "Population genetic structure of Phytophthora infestans in Ecuador". Phytopathology. 87 (4): 375–80. doi:10.1094/PHYTO.1997.87.4.375. PMID 18945115. ^ Spielman, L. J.; Drenth, A.; Davidse, L. C.; Sujkowski, L. J.; Gu, W.; Tooley, P. W.; Fry, W. E. (1991). "A second world-wide migration and population displacement of Phytophthora infestans?". Plant Pathology. 40 (3): 422–30. doi:10.1111/j.1365-3059.1991.tb02400.x. ^ Flier, W. G.; Grünwald, N. J.; Kroon, L. P. N. M.; Van Den Bosch, T. B. M.; Garay-Serrano, E.; Lozoya-Saldaña, H.; Bonants, P. J. M.; Turkensteen, L. J. (2002). "Phytophthora ipomoeae sp. nov., a new homothallic species causing leaf blight on Ipomoea longipedunculata in the Toluca Valley of central Mexico". Mycological Research. 106 (7): 848–56. doi:10.1017/S0953756202006123. ^ Goss, E. M.; Cardenas, M. E.; Myers, K.; Forbes, G. A.; Fry, W. E.; Restrepo, S.; Grünwald, N. J. (2011). "The plant pathogen Phytophthora andina emerged via hybridization of an unknown Phytophthora species and the Irish potato famine pathogen, P. infestans". PLoS ONE. 6 (9): e24543. Bibcode:2011PLoSO...624543G. doi:10.1371/journal.pone.0024543. PMC 3174952. PMID 21949727. ^ Cárdenas, M.; Grajales, A.; Sierra, R.; Rojas, A.; González-Almario, A.; Vargas, A.; Marín, M.; Fermín, G.; Lagos, L. E.; Grünwald, N. J.; Bernal, A.; Salazar, C.; Restrepo, S. (2011). "Genetic diversity of Phytophthora infestans in the Northern Andean region". BMC Genetics. 12: 23. doi:10.1186/1471-2156-12-23. PMC 3046917. PMID 21303555. ^ Goodwin, S. B.; Cohen, B. A.; Fry, W. E. (1994). "Panglobal distribution of a single clonal lineage of the Irish potato famine fungus". Proceedings of the National Academy of Sciences. 91 (24): 11591–95. Bibcode:1994PNAS...9111591G. doi:10.1073/pnas.91.24.11591. PMC 45277. PMID 7972108. ^ Yoshida, K.; Schuenemann, V. J.; Cano, L. M.; Pais, M.; Mishra, B.; Sharma, R.; Lanz, C.; Martin, F. N.; Kamoun, S.; Krause, J.; Thines, M.; Weigel, D.; Burbano, H. A. (2013). "The rise and fall of the Phytophthora infestans lineage that triggered the Irish potato famine". eLife. 2: e00731. doi:10.7554/eLife.00731. PMC 3667578. PMID 23741619. ^ Fry, W. (2008). "Phytophthora infestans: The plant (and R gene) destroyer". Molecular Plant Pathology. 9 (3): 385–402. doi:10.1111/j.1364-3703.2007.00465.x. PMID 18705878. ^ Lehtinen A, Hannukkala A. (2004) Oospores of Phytophthora infestans in soil provide an important new source of primary inoculum in Finland. Agricultural and Food Science 13:399–410. ^ "Study provides evidence on movement of potato famine pathogen". Retrieved 29 December 2016. ^ Fry, WE (2008). "Phytophthora infestans: the plant (and R gene) destroyer". Molecular Plant Pathology. 9 (3): 385–402. doi:10.1111/j.1364-3703.2007.00465.x. PMID 18705878. ^ "Phytophthora in nursery stock and restoration plantings". 4 September 2017. ^ Baker, K., ed. (1957). The U.C. System for Producing Healthy Container Grown Plants, Manual 23. University of California, Division of Agricultural Sciences, Agricultural Experiment Station Extension Service. ^ "Beaumont period". botanydictionary.org. Retrieved 3 March 2013. ^ a b "The Microbial World: Potato blight – Phytophthora infestans". Retrieved 3 March 2013. ^ "Obituary: L. Smith". The British Society for Plant Pathology. Retrieved 3 March 2013. ^ Fall, M. L.; Van der Heyden, H.; Brodeur, L.; Leclerc, Y.; Moreau, G.; Carisse, O. (6 June 2014). "Spatiotemporal variation in airborne sporangia ofPhytophthora infestans: characterization and initiatives towards improving potato late blight risk estimation". Plant Pathology. 64 (1): 178–190. doi:10.1111/ppa.12235. ISSN 0032-0862. ^ "Oxathiapiprolin" (PDF). New Active Ingredient Review. Minnesota Department of Agriculture. October 2015. ^ Gevens, Amanda, University of Wisconsin Madison Extension. Managing Late Blight in Organic Tomato & Potato Crops. ^ "Great Famine potato makes a comeback after 170 years". IrishCentral. 2013-03-03. Retrieved 2013-03-05. ^ The Origin of Plant Pathology and The Potato Famine, and Other Stories of Plant Diseases. ^ Carefoot, G.L. and E.R. Sprott. 1967. Famine on the Wind: Man's Battle Against Plant Disease. Rand McNally. Grünwald, N. J.; Flier, W. G. (2005). "The Biology of Phytophthora infestans at Its Center of Origin". Annual Review of Phytopathology. 43: 171–90. doi:10.1146/annurev.phyto.43.040204.135906. PMID 16078881. Yoshida, Kentaro; et al. (2013). "Rise and fall of the Phytophthora infestans lineage that triggered the Irish potato famine". eLife. 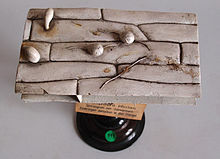 2 (in press): e00731. arXiv:1305.4206. doi:10.7554/elife.00731. PMC 3667578. PMID 23741619. Goss, E. M.; Tabima, J. F.; Cooke, D. E. L.; Restrepo, S.; Fry, W. E.; Forbes, G. A.; Fieland, V. J.; Cardenas, M.; Grünwald, N. J. (2014). "The Irish potato famine pathogen Phytophthora infestans originated in central Mexico rather than the Andes". Proceedings of the National Academy of Sciences. 111 (24): 8791–96. Bibcode:2014PNAS..111.8791G. doi:10.1073/pnas.1401884111. PMC 4066499. PMID 24889615. Martin, Michael D.; et al. (2013). "Reconstructing genome evolution in historic samples of the Irish potato famine pathogen". Nature Communications. 4: 2172. Bibcode:2013NatCo...4E2172M. doi:10.1038/ncomms3172. PMC 3759036. PMID 23863894. Martin, Michael D.; et al. (2016). "Genomic characterization of a South American Phytophthora hybrid mandates reassessment of the geographic origins of Phytophthora infestans". Molecular Biology and Evolution. 33 (2): 478–91. doi:10.1093/molbev/msv241. PMC 4866541. PMID 26576850. Species Profile – Late Blight (Phytophthora infestans), National Invasive Species Information Center, United States National Agricultural Library. Lists general information and resources for Late Blight. This page was last edited on 27 February 2019, at 08:09 (UTC).